Besides the smaller size and the addition of ultra-high-definition 4K/HDR capabilities, here’s what you'll get when you upgrade to Xbox One X or Xbox One S.
Unlike the original Xbox One, both Xbox One X and Xbox One S allow vertical as well as horizontal positioning. Vertical positioning requires a stand, however. Not every console bundle includes one, so you may need to buy it separately. Apart from the unique vertical stands needed for Xbox One S and Xbox One X, all Xbox One accessories work with all Xbox One consoles. If you plan to use a Kinect sensor with Xbox One X or Xbox One S, you'll need a Kinect Adapter. For details, see How to use an Xbox One Kinect Sensor with Xbox One X or Xbox One S.
When you're ready to connect wireless controllers, you'll find that the controller button hasn't changed, but the button on the newer consoles has moved from the side to the front, below the power button. For more info, see Connect a wireless Xbox One controller. The Xbox One wireless controller that comes with Xbox One X and Xbox One S works with both Xbox consoles and—via Bluetooth radio—Windows 10 PCs. For more about using Bluetooth on a PC, see Using Xbox One Wireless Controllers on a PC. 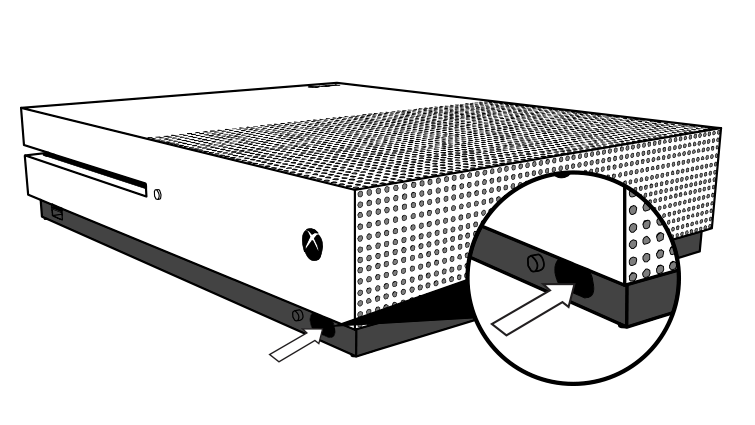 If you're using the Kinect IR capabilities to control devices such as your TV or audio-video receiver, note that IR blasting is built into the front of Xbox One X and Xbox One S. If you keep your Xbox in a cabinet, make sure your console’s IR blaster isn’t blocked. All your digital and disc-based Xbox One games work with Xbox One X and Xbox One S.
Licenses for digital games and apps travel with your Xbox profile, but you'll need to manually download any games you've bought. Go to My games & apps > Games, then select the Ready to install tab and choose the ones you want. If you're using a compatible UHD TV , take advantage of 4K and HDR games (played in their native resolution on Xbox One X and upscaled to 4K on Xbox One S) and disc-based 4K Blu-ray movies. On connection, your Xbox One X or Xbox One S will automatically recognize your TV and prompt you to update your display settings. For more info, including setup details, see Troubleshooting 4K and HDR on Xbox One. In addition to wireless protocols 802.11 a/b/g/n dual band, Xbox One X and Xbox One S include 802.11ac in their supported network protocols. If you have a wireless AC router, use that to connect to Xbox Live. Would you like to contact Support regarding the "Benefits of upgrading to Xbox One X or Xbox One S" issue you were reading about or a different issue?